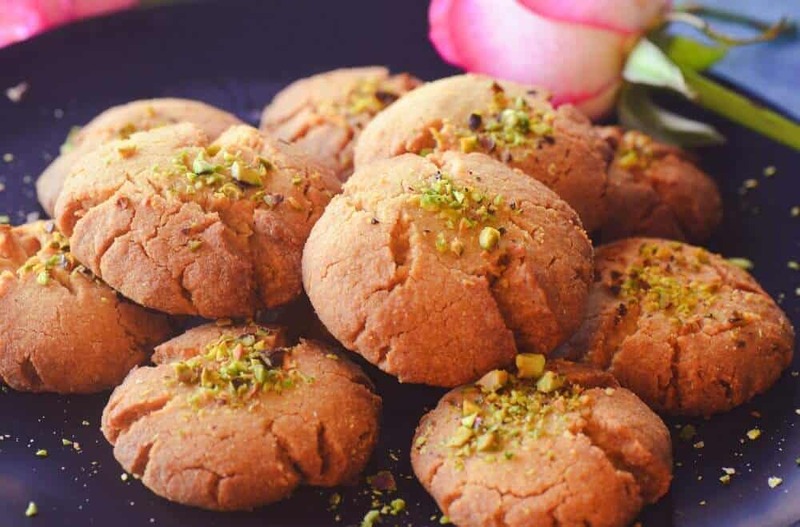 Nankhatai–desi cookies is a huge hit with kids as well as adults. What cakes are to English tea, these tiny bite wonders are to Indian tea time. Many biscuits are available in the market these days.Some people nibble it at teatime without realizing how much sugar is in it. Hence, the weight loss programs have a slower success although you may be regular. So, you either let go of cookies or add extra workout schedules. Also, kids today are at a greater risk of sugar related problems. Diabetes in kids is probably the fastest growing concern. They are an easy target too. Most industry produced biscuits are probably just plain flour and almost 30% sugar. Furthermore,adding of food colors,additional preservatives and commercial essence makes it worrisome in the long run. Here is a healthy homemade Nankhatai which you will love.It also gives a personal touch to all your kitty and tea parties. Heat the ghee until warm.Add powdered sugar and mix well. Now,add flour,gram flour, semolina, cardamom and baking soda into the mixture. Knead the flour and make a smooth dough. Take a small portion of the dough.Roll it with hands to make a round ball. Press it lightly to make a flat cookie,at least 1 inch thick. Garnish with pistachio,press it a bit on the top of the cookie. Place the dough on a greased tray or over a baking paper. Ensure that they is enough space for them to cook because they will expand and double up in size. Preheat the oven at 180 deg C for 5 minutes. Bake the cookies at 180 deg C for 10 minutes. Check the nankhatai and bake for further 5-­7 minutes until golden brown. Keep it aside to cool.Store Nankhatai in an air-­tight container.Enjoy with tea or coffee. You may use plain flour instead of whole wheat flour which is used in the traditional recipe. We have used wholewheat flour because it is healthier. You may use any nuts like almonds,macadamia,walnuts,pine nuts for garnish. Click here for more dessert recipes. Click here to see additional recipe videos.